Motor for compressor and coupling. Motor starter and control panel. Neccesoreis valve and control valve for the packaged. ITC brings you a full package of machines completely assembled for refrigeration and air conditioning system. With GEP standard, we design it to have a highly efficient performance. 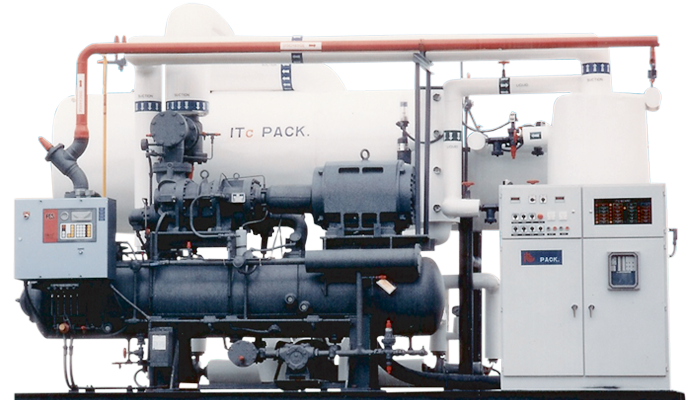 ITC-pack machine is built in complexity and innovative design (which consists of GEA-FES screw compressors, low side separator, motor for compressor and coupling, dual ammonia circulating pumps, liquid receiver, high side float control, motor starter, control panel and control valve). It is extensively employed in various industries, petrochemical plants and many more. This is our high quality premium package, which widely recognizes for its reliability, versatility and durability. Dazzlingly, all are packed in one. GEA-FES screw compressor serves as the heart of the system containing refrigerant along the motor. Liquid receiver regulates the high pressure vessel, while the accumulator controls the low pressure vessel and promptly separates the refrigerant (e.g. gas and liquid). Also motor starter, control panel, high side float control device and electrode type level controller maintain a safety control and perform a smooth operation. Neccesories valve and control valve for ther packaged.